How many times do you find a wall full of graffiti that you want to take a picture of because it’s interesting to you and because you can’t read a single word of it? 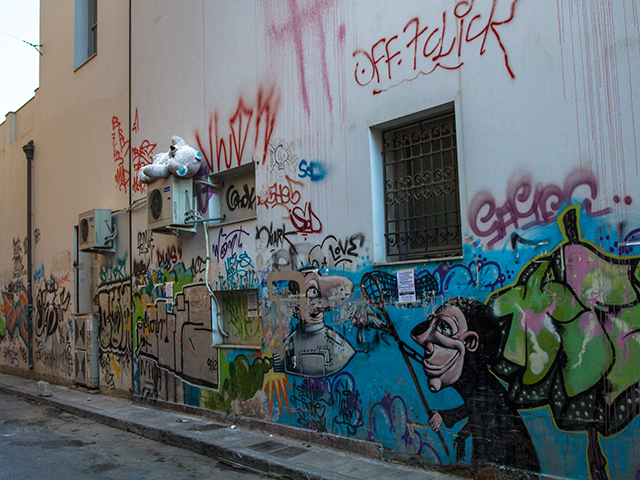 Chances are, if you’re in Athens, Greece, more than once. What are the odds after that though, that you discover a big huge white teddy bear sunning itself on an air conditioner? I bet the odds on that one are a lot less high. So I count myself as being the lucky winner of the Teddy Bear Alley Shot. How do you suppose that guy got up there? He was completely clean, if he had been tossed and missed, trust me, in that alley, he would have had some signs of dirt. But he was in pristine condition and way too high to have just been set up there. That led me to thinking that maybe two people worked together to get him up there. But why? Were they stealing the bear from some poor little kid? Anything is possible but I guess my mind doesn’t work in circles quite that mean so I quickly moved on to other options…such as ‘I don’t know’. I’d rather think that I don’t know the answer than to think that two different people got together to take a child’s big huge teddy bear away from him. Some days you just need to keep your head in the clouds!